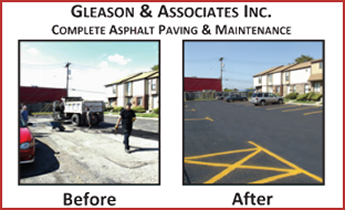 When it comes to asphalt repair, your parking lot or road deserves the best. Choose Gleason and Associates Inc. in Roseville, Michigan, for service you can always rely on. Drafted into the US army in 1967 during the Vietnam war, after serving two years in the military, Ronne Gleason, the founder of Gleason & Associates Inc, exercised his opportunity to earn his bachelor's degree from the University of Michigan under the GI Bill with concentrations in psychology and comparative religion. While attending the University he noticed a man striping the school's parking lot that prompted an eureka moment. He pondered that, even though he was training for an eventual position in a local mental hospital as a clinical psychologist, he was reconsidering this ambition in light of his new found discoveries in religion and philosophy and its practices. The first conclusion he came to was that he did not want to be tied down to a year around 9-5 p.m. career that would inhibit his study of all religions and ancient philosophy, a preoccupation that would soon alter his sense of purpose in life. Capitalizing on his observation of that lone parking lot striper, Ronne commenced his parking lot striping and power sweeping business in 1971 while still working towards his bachelor's degree, realizing that a formal education was critical to monetary success in life. Besides, his love of learning was, and is to this day, unquenchable, hence the longevity of his business, since it has provided the ideal stream of a seasonally based income that required/requires only four to five months out of a year for devotion to the business leaving the remaining months for an intense devotion to the study of ancient religions, philosophy and ancient literature. This is a perfect opportunity for the founder to thank all his loyal customers for enabling him to earn doctoral degrees in theology and naturopathic medicine. Also, while not graduating from Harvard University, he underwent three years of post-graduate studies in comparative religion, an experience of lifetime commuting each week to Cambridge, MA to attend classes. Now, more directly related to business, he earned his certificate in Human Resources Studies program at Cornell University's School of Industrial and Labor Relations. This seeming esoteric world of the founder is by no means unrelated to running, operating and managing a business that is very crude and literally down to earth. While the study of aforementioned disciplines sends the imagination into wondrous realms, unless one can realign ancient pearls of wisdom into everyday life they are of no use. Any business is all about getting along with people, whether it be the employee or the customer. The study of the humanities is likewise, all about people and their relationship to not just the Divine, but also, the visible world. Ronne enjoys being on the patching and paving crews, a task he has been doing for eighteen years ever since he cut back on advertising to enable such an effort. The satisfaction he derives from overseeing the creation of a finely groomed parking lot is as great, if not greater, than presenting a finely crafted essay or poem. Yes, even after all these years, the same sense of achievement still lives on in this founder. Ronne's brother Randy has sealed thousands of parking lots and driveways over the decades (38 years). He also runs the asphalt, seal coating and striping crews; his son, William, operates the rollers and blowers for the patching and seal coating crew. His sense of detail and appreciation for any well articulated document is something you will see in his precise and thorough estimates, often with clearly spelled out options. All estimates are free of charge. Get our low bid last! We aim to serve! from specialists that care about your road.